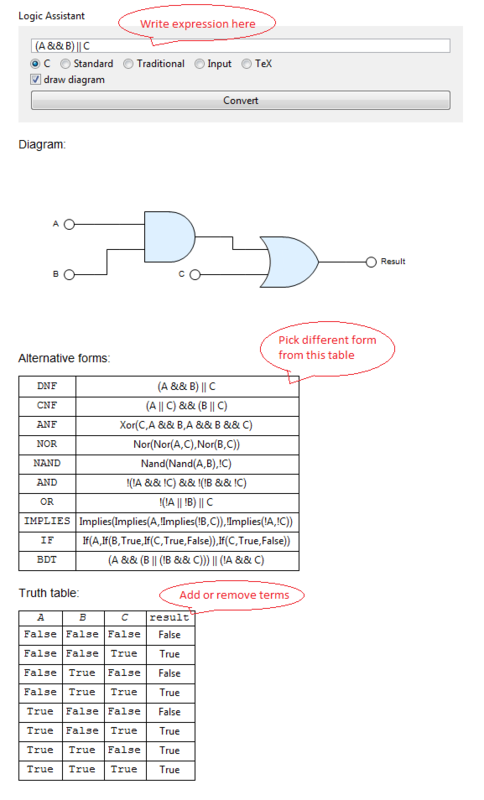 The Logic Assistant is a simple GUI tool that can be used to visualize and convert boolean expressions between different forms. The Logic Assistant was implemented as a Mathematica notebook. As such, it is portable and works on any system supporting Mathematica, including Raspberry Pi. The Logic Assistant is a free software, distributed under the GPL v. 3.0 license or other, if requested. Source package: Mathematica notebook file. Note that this file relies on the Prodiams package, which needs to be installed on the target system. Need more information about the Logic Assistant tool? Do not hesitate to ask.